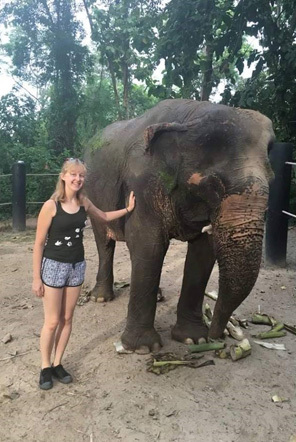 Sophie shared her experiences of volunteering for 2 weeks at the Under 18 Elephant Care and Wildlife Rescue project in Thailand. 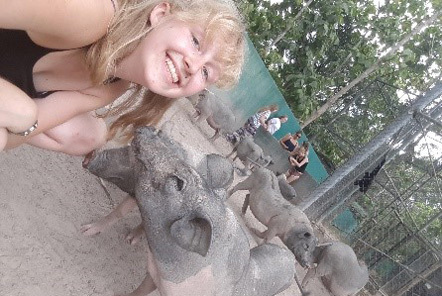 Thank you so much to Sophie for sharing her fantastic blog with us! “6am alarms don’t tend to go down well with me- not really a morning person- but today marks the beginning of my biggest adventure yet, and I couldn’t wait for it to start! I’ve been packed for almost a week now, and finally got to load my suitcase into the car to be dropped off at Heathrow. We didn’t have too much trouble finding Erin (our wonderful team leader), and soon the whole group arrived (minus Emily who we met in Bangkok). Everyone was a bit nervous at first, but soon after our parents had left, we all started chatting and by the time we were in the queue for baggage drop off, it was as if we’d all met before! As someone who gets travel sickness, I was dreading the 12 hour flight, but Thai Air made it so amazing! I was so excited, I struggled to sleep and the temptation of films was too much! From Bangkok, we had a long, sleepy transfer in what looked like a disco bus, full of Buddhas with a mirrored ceiling. I always find it fascinating looking at the surroundings as I drive through a new country for the first time; I was surprised how many memorials of the King and Queen there were, and all the mini temples at the side of the roads. Occasionally you pass a huge statue of religious significance, leaving you wondering what they all mean. The group has been split over Elephants and Wildlife, and further into sub-groups. Over the course of the week, I could have the opportunity to work in the groups Bears 1 & 2, Primates 1 & 2, Other Wildlife or Quarantine. For my first two days, I worked with ‘Other Wildlife’. I met new volunteers from America, Scotland, Thailand and Spain, and am loving learning about the local culture and everyone’s lives at home. When working on wildlife, the mornings consist of lots and lots of chopping. In our group, we prepared meals for turtles, peacocks, deer, birds, squirrels, pigs, a cassowary and not to forget- Pidgey (the Pidgeon who thinks he is one of us). After food prep, we do a feed out before breakfast. After a big breakfast, it was time for enrichments and cleaning the enclosures. For iguanas, we shower them with a hose, and it so sweet to see their faces as they enjoy it. For the parrots, we pushed seeds into bananas which they grip and pull the seeds out with their teeth or we tied corn to the outside of the enclosure. The pot-bellied pigs love their enrichment of chopped banana tree trunks, which they destroy to eat the soft centre. You just have to watch out for them pushing to be first for food, even when it’s still in your hands! Bernie, the cassowary is my favourite so far, his story of how he came to be brain damaged is a sad one, but he’s so endearing and lovely to feed and watch. I’m sweaty, gross, but loving it so far! In the first couple of evenings, we have been chatting and playing cards with snacks, after a walk down to the local village (the air-con in 711 is heavenly). After our day off, I was allocated a group working with the bears! Jobs whilst working with the bears include a morning feed and enclosure cleaning. The bears are so chilled that in one of the enclosures, there is a brave black cat who is accepted as part of the group! What is good about each of the groups is that it is so varied, and you aren’t limited to one species, so we also got to clean the nocturnal enclosures this morning. Today was also my birthday and despite being a bit ill, the group and other volunteers sang me and Kirstie happy birthday and we had cake! 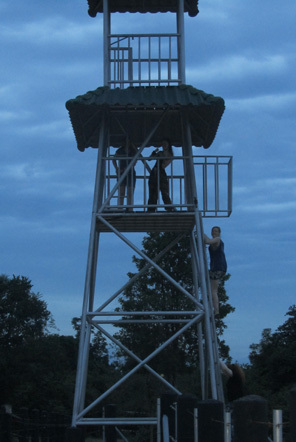 This evening we ventured up the Elephant Tower (a tall structure in Midlands, which you can scale and see the sunset from) for the perfect end to an amazing 18th Birthday! For my last two days on Wildlife, I worked with the two different primate groups. These both involve a lot of walking and carrying watering cans and food, but learning about the monkeys we help makes it so worthwhile. After the morning water rounds for the gibbons, we prepare over 100 portions of food for the gibbons and macaques (the langurs have a different diet), before making our way around the centre and forest for a feed out. At each gibbon enclosure, you hoist food up in plastic baskets as they are canopy monkeys, who forage in the trees for food. For the macaques, who forage on the floor, you throw food into each enclosure of put it in low baskets. There’s definitely an adrenaline rush in trying to feed monkeys in-sync and move before they get close enough to grab you! Other roles on primates include cleaning a bear and cassowary pool, langur enclosures and making frozen parcels and kebabs for enrichment. The past two evenings, we have made trips down to the village and had a games night of competitive Uno, Dobble, Irish Snap and Animal Snap! After a hard, but rewarding week with Wildlife I am looking forwards to swapping to Elephants tomorrow but am going to miss working with such a wide variety of animals, doing so many different jobs! Our timetable for days on elephants is much more calm, compared to wildlife, leaving us lots of time to admire the animals and have a really good laugh with all the mahouts. 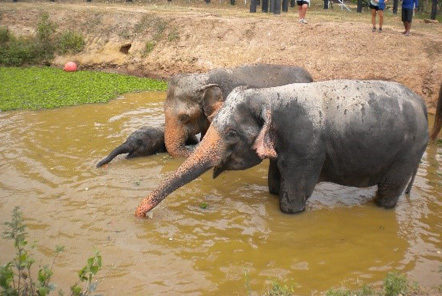 On our first day, I had the opportunity to work with Pin & Pun (and their mahout Pon), and the adoptive aunties Kew Petch and Laong Dao, whom the mother and baby spend their days with. The best bit of the day is watching Pin run from her day to night enclosure, playing with everything in her path! 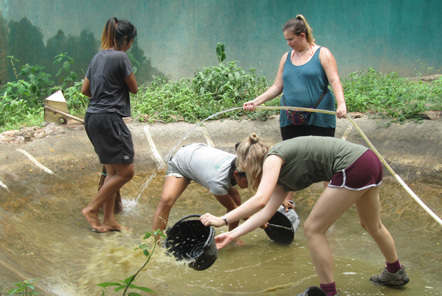 The heat is so strong that you quickly get over wearing gardening gloves to compost; picking up dry elephant poo with your hands isn’t that bad! For enrichments today, we made fruit parcels and hung corn from the rafters of Pin and Pun’s night enclosure, which was quickly demolished! You very quickly learn how mischievous the mahouts are, after having a tin can hooked to your shoes without you realising, finding ice melting on your head or hidden rocks in heavy baskets you’re carrying! This afternoon, we threw fruit in the lake and watched the elephants swim around and under each other, which was particularly rewarding after getting knee-deep and cleaning the algae off the top of the lake this morning! 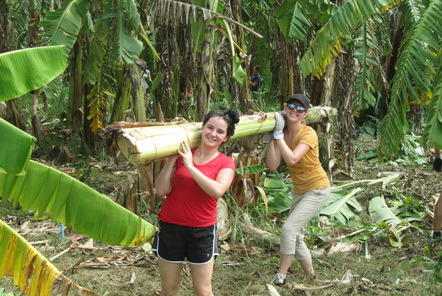 Every other day we carry out a harvest, where we drive on the open back truck to a plantation, where the mahouts chop down banana trees for us to carry back to the truck. These will feed the elephants for the next couple of days and provide us material to help make string and parcels for enrichments. We head out to harvest after feeding salad and making banana balls, and managed to fill the truck in just over an hour because we were determined to be finished before it got too hot. After filling the truck, we jumped back on and headed down to the river where we could jump in and swim about, leaving you feeling so much cooler and clean! On return to the centre, I went back to my group, working with Chok Dee and Rung Tip, to do their afternoon walk and bath. We do salad and banana balls again in the evening, after composting their enclosure and leaving out their enrichment for them to enjoy as the sun sets. 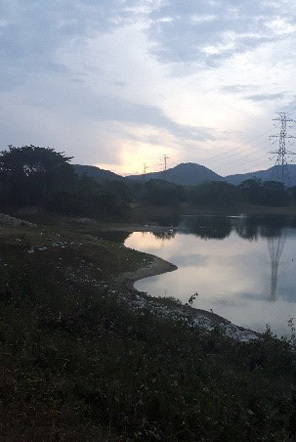 There are seven elephants up at Newlands currently, including the bull (Khan Kluey), See Puak, Duen Pen, Nam Phon and Nam Fon, Wasana and Som Boon. To get to Newlands, you ride on a truck, which the dogs also enjoy, and our day involved the usual salad, banana balls, enrichment and composting with special projects of cleaning Khan Kluey’s indoor pool and Pin & Puns lake again. Watching him dive head first into his lake was highly amusing, making a humongous splash! This evening was quiz night and we got to see just how much we’d learnt this week about the country and the centre, and also a bit of general and song knowledge! After our second day off, I spent the day with Jelle. She is a very peaceful elephant, with striking blue eyes. 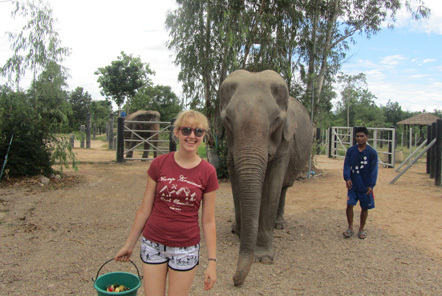 Due to being underweight, she gets fed 4 lots of banana balls and salad per day, with a bit of extra fruit that Rod (her mahout) manages to sneak into our wheelbarrow! For enrichment, we spoilt Jelle with a big fruit log and a tyre filled with fruit for after her forest walk. Today’s special project was definitely an experience! As you can’t get into Khan Kluey’s enclosure whilst he is in there, we can’t compost (poo-pick) very often, so once in a while, we venture in whilst he is kept busy in his separated enclosure. The idea is to pick up every piece of poo and throw it over the tall walls (tip- underarm is much more successful, overarm, you smash it straight into the wall). 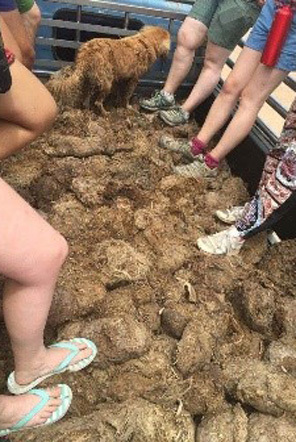 After that, you follow the truck around the outside of the walls and pile it up with poo to be taken and composted back at midlands. A truck and a half later and we were finished! Although it sounds unpleasant, it was the most rewarding special project yet, even though the dust gets literally everywhere! The oldest elephant on centre is Pai Lin, and she is amazing to work with. Despite her age, she is very playful, but gentle and gets distracted by everything on her walk! I did another harvest today, which was really easy as the trees were tiny and already cut for us as they came from Buddhist Temple grounds, which was stunning. At the lake, we had a water fight with the mahouts and were back in time to walk and shower Pai Lin again before lunch. Our special project today was to clean out the peacock enclosure, where we managed to pick up some feathers and porcupine quills, which I have kept for my scrapbook. After making fruit strings for enrichment, we walked Penny and Kevin, the dogs and Midlands. 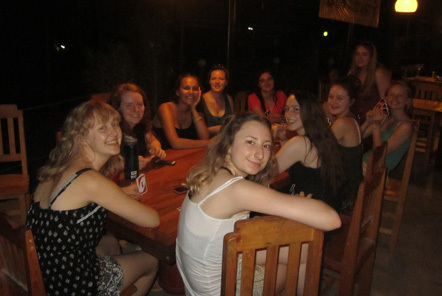 Unfortunately we had to start packing this evening to prepare for going home tomorrow, before having our final group photo and a bit of a games night. Our first day off, was on our 3rd full day. Me, Kizzie and Zoe made an early morning trip to the supermarket for pancake fillings, then came back to make a late pancake breakfast in the volunteer kitchen. Volunteer hack: Cadburys melts VERY well on warm pancakes, and it is DELICIOUS. We took a short walk to the Buddhist temple, the grounds of which the centre is situated on, which we walked around bare foot. We didn’t see any monks today, but the architecture and statues we’re stunning! 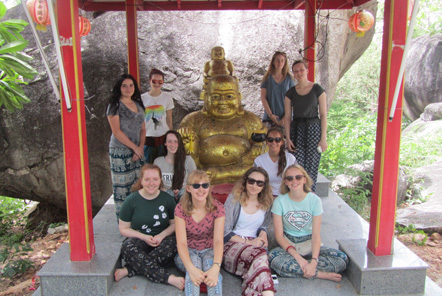 There are loads of tiny details in all the paintings behind the monuments in each temple, and the white flowers and coloured scarves make it such a tranquil place to walk around, amongst the huge boulders. After lunch we had a short drive to Kuri Buri National park for an open back drive, to try and spot some wildlife. Not long into our drive, we spotted the first wild elephant I’ve ever seen! At a lookout point, we saw a herd of guar and a group of elephants, with calves, in the distance. On our way back, we spotted some exotic birds, lots of anthills and watched the hundreds of tiny yellow butterflies as we drove past. That evening, we took a trip to Hua Hin for dinner and a night market. The market was full of clothes, souvenirs and local delicacies. On the bus home, we had a great time, belting out lots of Phil Collins, McFly and Aladdin, all the way back! Mid-way through our week on elephants, after a long working stint, we felt like we deserved this day off! We left early for the spa, and arrived pretty quickly after a slightly hairy drive there, spending the day in the pool and ‘shadebathing’. The spa was beautiful and felt very relaxing, with jungle showers and a tranquil area to walk around. Some of the girls had a rather firm massage, but said they felt much better afterwards. We headed back in time for dinner, then caught another bus out to Cha Am. We stopped off first at the bat caves, and sat on a rooftop seating area, listening to the bats inside the cave, waiting for them to emerge. It was a sight difficult to take pictures of, but was so beautiful to watch, seeing the streams of bats dance around the sky. After that, we drove to the Cha Am night market in the sunset and roamed around, searching for food amongst the bright, pungent stalls of local delicacies. Some of us even tried fried crickets and mealworms! We finished the day, singing along to some old favourites in the car on the way back- not so sure how keen the driver was on them! The next evening, we took an extra trip to Tesco’s. Though it may sound mundane, the supermarket is pretty amazing! With its own KFC, Levi’s, Dunkin Donuts, what more could you want!? This would be our final trip out, so we stocked up on travel snacks, starting to prepare for our journey home. To mark the end of our trip, we got up to watch the sunrise over the front of the centre while reflecting on our experience. For our last day, we weren’t assigned a group so spent the morning taking photos and helping other groups with various tasks. After a shower and finishing packing, we managed to talk to Edwin, the founder of the centre and find out more about why he founded the centre, its challenges, rewards and its future, which was fascinating. 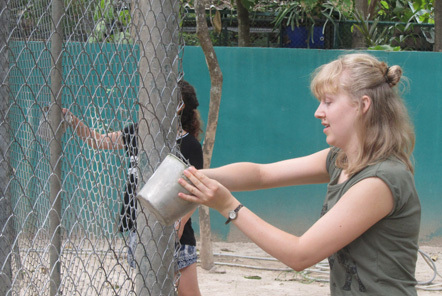 We then had a tour of the on-site veterinary hospital, meeting the orphaned monkeys and animals being cared for. Our final activity was a meeting with Dave, the volunteer coordinator. This was very eye opening as we learnt some more about the stories behind the animals that are here and the conditions they have come from, including videos of the phajaan (the elephant spirit ‘crushing’) and how animals are used as photo props and mistreated in the tourism industry. For me, this really highlighted how important our work here has been to give these mistreated animals a much happier remainder of their lives and to help them live as wild a life as possible, giving a few a chance of rehabilitation. This has really motivated me to spread awareness of why animals need to stop being exploited for tourism, because people are not aware of the damage they are causing when they endorse it. After our final goodbyes and salvaging some pizza from dinner, we headed off for the long journey home.